Nous avons décidé de mettre en place cette rubrique afin de laisser la possibilité à nos clients de s’exprimer sur l’opinion qu’ils ont de nos services. Nous chérissons vos points de vues car ils nous permettent faire ce qu’il faut pour continuer de nous améliorer et surtout continuer de vous satisfaire. 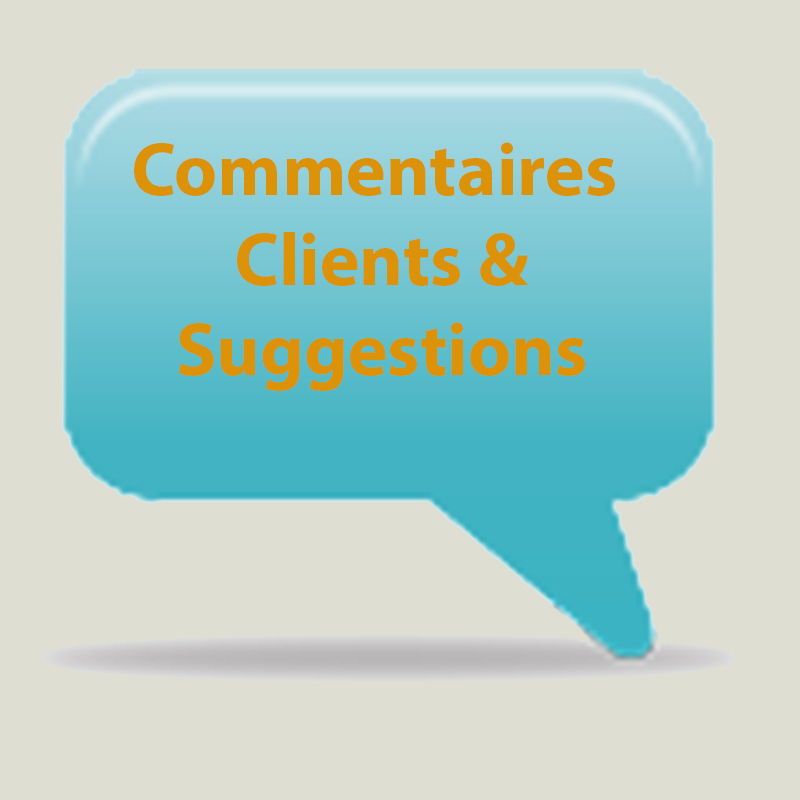 Toutes vos suggestions et commentaires seront donc les bienvenus et ils seront tous traités et inclus dans cette section avec impartialité dans l’unique but de partager vos expériences et de vous permettre de passer toujours de meilleurs moments au sein de notre établissement. We stayed here for one night, a whirlwind 2 day tour of paris. The hotel is lovely, very clean and quiet at night. The garden area looks lovely. The room was a great size and the bed was comfy, just what we needed after a busy day of walking! Only moan, it seems to have come up on here a few times, the hot water. We had the shower on for 20 minutes waiting for it to warm up. We called reception who said to just leave it on until it warms up as they have issues with hot water in the evenings. Seems a big waste of water to me! Wasnt such an issue the next morning, the water warmed up very quickly. The staff were friendly and helpful, happy to hold my bags until later the 2nd day before i returned to the airport. 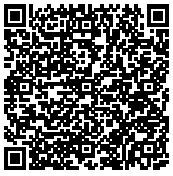 Its in a great location, 30 second walk from the metro so its easy to get around. The metro is easy to work out and get to the landmarks so id definitely recommend staying here. This hotel was wonderful! The room was very modern and clean, and I loved the separation from the bedroom to the foyer and the bath area. It was in a very nice neighborhood in Paris, so we met and enjoyed a true Parisian experience! Wonderful cafes all around the circle, metro station across the street. MUST go the the Boulangerie/Patisserie on the street off of the circle (almost opposite the hotel side) and get the almond croissant…how I miss them! Would definitely stay here again. This is a very clean and modern hotel. This hotel is particularly quiet and even had l’Occitane bathroom products. The staff were very helpful, although not quite accurate in their directions. The first day we had only warm water but after asking we had hot water every day. The Metro is only 100metres away and we managed to get to all places without too much trouble. The RER line (for getting to Versaille) is also only 100 metres away too. The breakfast at the hotel was a little pricey at 18 euro each so we opted for a local cafe about 100 metres away next to the Metro entrance and got a lovely breakfast each morning for about 6 euro each. I would have no hesitation staying here again. if your looking for a nice hotel to put your head down at night in a safe area here it is , rooms were nice and staff were good. the hotel is right near a underground train so its easy to get around the city. Very central to Arc de Triomphe – a 15 minute walk away. Friendly staff who spoke good English. Staff guided us and booked tickets as required and helped us reach points of interest. They also advised where taxi ranks were rather than having one come to the hotel at an additional 7 euro’s (100m away). Room was clean and tidy and it was nice to have a small balcony to let in fresh air. I’d describe the room as “funky” with cool furniture and modern amenities. Bathroom decent sized. Only negative was a leak from the wall to the side of the bed. This seemed to get worse during our 4 night stay and appeared to be a pipe leak. On checking out, staff were not very interested but offered to credit our mini-bar expenses for the inconvenience. Would definitely stay again. I have just come back after a 4 night stay at the Hotel Ampere and I can honestly say it was the best hotel I’ve ever stayed in. The service of the staff was absolutely brilliant and everyone is so friendly, they really went above and beyond to help us have a fantastic stay. The hotel itself is absolutely lovely, with beautiful decors and finished to a superior quality. The garden was my favourite area of the hotel, with beautiful furniture and lighting in the evening. 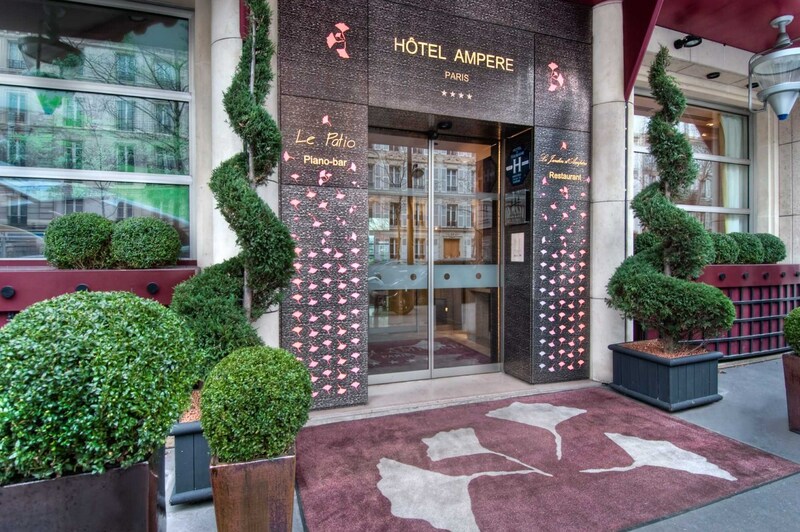 In terms of location the Hotel Ampere is in the perfect place, with Metro & RER stations within a minutes walking distance that you can take to anywhere in the city. The Hotel and it staff deserve 5 stars at least, you will not regret staying at this beautiful piece of Paris and I highly recommend having the Breakfast in bed as it was absolutely perfect. I will definitely be staying at this Hotel again and look forward to returning. Inviting feel and helpful staff but after a hard day at work no hot water. I compalined the next day and they said it will be fixed. The next day, hard day at work but no hot water. I would not normally mind but paying 280 Euros a night you would expect better. No apology from front desk until I emailed. You would think they would have not charged me for breakfast at least! Although we only used the rooms for sleeping, the hotel rooms are more spacious than any of the hotels I have stayed in Paris previously. The carpet & furnishings are new & very comfortable. The continental buffet breakfast is an additional €18 per person but we were informed of that during check in. It’s better value than eating at the cafés outside. The staffs have been very attentive & polite during our entire stay. The location is not exactly central. It’s close to Pereire metro stop & about 25-30mins walk to L’Arc De Triomphe/Champs Élysées (about te same time if taking the metro due to the stops & line changes). Just something to consider when booking but can’t fault the hotel for that to be honest. Booked 4 day stay with three friends as part of a package with Thomas Cook/easyjet – great value and we were not disappointed with this hotel. Rooms were spacious, modern and clean – had a view from the 5th floor overlooking the gardens and as a result it was quiet and tranquil. Really comfortable beds much needed after a tiring day sightseeing in Paris. Heeded the warnings of other Tripadvisor members and gave the hotel breakfast a miss. Often had breakfast at a cafe right next to the Metro entrance- lovely creamy omelettes and later in the day a delicious onion soup at the same place. Hotel is very close to the metro ‘Pereire’ on Line 3 – just 6 stops along the line and you were at Opera/ Galeries Lafayette area – 2 stops further on line 7 and you were at The Louvre – so we did not feel like it was too far from the main tourist attractions. Have been to Paris a few times and this was the best value and most comfortable hotel I have ever stayed in in Paris – will definately be back. We made our reservations on booking.com. Very clean and modern. Room was great. Being an American tourist we appreciated the friendly staff. Lot of places near by to eat and the metro is very close. Only downfall is that it is far from the main tourist attractions. However the Arc de Triomphe is within walking distance. Please note that the room service continental breakfast is 22 euros per person. Very beutiful Paris neighborhoods nearby. Got taxi from the charles de gaulle airport €50for 4 of us. Arrived at 10 they looked after our bAgs till rooms were ready at 2. Rooms on 8th floor overlooking courtyard. Very comfy bed slept well although quite warm not sure air con would be great in summer. Would have liked a tea/coffee making facility in room. Bath very narrow, wasn’t sure I would fit! Nice l’occitane products. Shower had good pressure, towels were a good size. Walked to arc de triumphe about 15mins. Used red bus to get around from there but I think metro would have been cheaper/quicker. Eiffel tower was too busy as only one lift working oh the louvre is closed on Tuesday’s. Had breakfast in both cares on square, both fine preferred second one away from hotel. Mono prix around corner useful for water etc plenty of restaurants nearby also at wagram. Free wifii in hotel rom very hady. Got taxi back to airport cost less than €40 takes about 30mins. Small rooms but perfect for short break,could have done with a couple of drawers though. 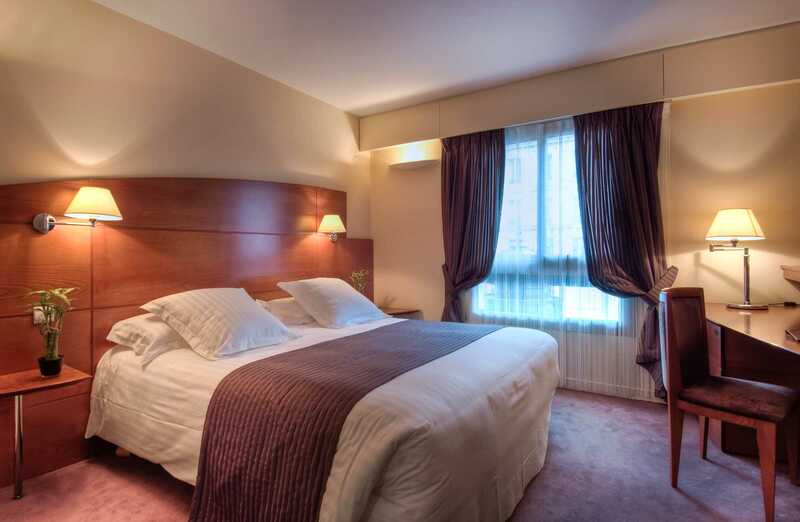 Good hotel well located close to metro and rer to Eiffel tower and Norte dame. Lovely location, 30 secs walk from a Metro station. Clean, efficient hotel. One of the quietest hotels I have ever stayed in. Comfortable, average size rooms. Good value when booked in advance. There is no information on the charge for breakfast until you pick up your bill. Whilst 18 euros is towards the top-end of average for continental Europe, I have had much better breakfasts for this price in many other hotels. FREE INTERNET!!!! Normally you will have to spend around 20 ~ 25 dollars a day for the internet service in your room but this hotel offers the free wifi for all the guests. The hotel is located very close to the subway system and the room is very nice and clean. I love how the shower is separated from the toilet so I don’t have to fight with my husband!!! Charming hotel with an excellent location. Beautiful & comfortable rooms with excellent beds. Very quiet nights.and well equipped bathrooms. The rooms are not large but are incredibly comfortable and spotlessly clean.We will come back ! Great location, close to MonoPrix, Metro, RER, Arc De Triomphe. Good restaurants close by. Room is pretty small but has modern interior design, clean, plush carpeting, modern bathroom with L’Occitane products and marble throughout, flat screen tv, free wi-fi, balcony. Had minor mishap when I was double charged for room incidentals… I paid cash and my credit card was charged too. Hotel Deputy Manager resolved my issue to my satisfaction. I received a refund after a few exchanges of emails with the deputy manager. We stayed there during autumn, in a superior well decorated room. Despite the large bathroom the rest of the room wasn’t really spacious. However, the stuff was very polite and the breakfast was basic. The best thing was the metro station next to the hotel! I stayed in this hotel for 3 nights during a conference and I must say that I loved it. It has lovely personel and very nice food. It has a very good location as well, lot of restaurants and pubs around, also not too away from Arc de Triomphe. The music in the bathroom was great, spa lotions were amazing.